The Chill-Its Phase Change Cooling Vest by Ergodne can help anyone who\xCDs dealing with extreme heat for long periods of time maintain a much cooler temperature. You can recharge the cooling pack with the following methods: cooler of ice water -10 minutes; freezer-15 minutes; refrigerator-25 minutes; or near an air conditioner for 1-2 hours. 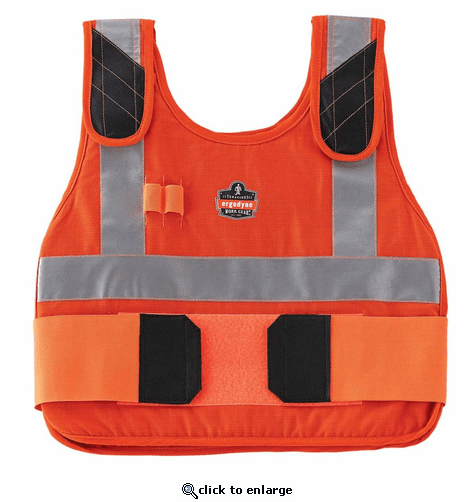 Perfect for construction workers, utilities, fire/rescue workers, and anyone dealing with extremely hot conditions. This vest works with a freezer insert that can be reused over and over again. Grueling hot conditions - whether its related to weather, protective clothing or confined spaces - exposes people to the dangers of heat stress. Ergodyne Chill-Its Phase Change Cooling Vests keep you cooler, safer and more productive. How to use your Ergodyne Chill-Its Phase Change Cooling Vest and Pack: You can recharge the cooling pack as follows: cooler of ice water_10 minutes; freezer_15 minutes; refrigerator_25 minutes; near an air conditioner_1 to 2 hours. According to USA Today, 65% of workers either do not want to work at all or work slower when it gets hot and humid. As heat goes up, work inevitably goes down if steps are not taken. CARE: The cooling pack should be washed by hand with mild detergent and warm water. Dry with a paper towel or cloth. DO NOT machine wash or machine dry. The fabric carrier is machine washable in mild soap; line dry.